Andrea is great researcher with a good temper, generous and funny. Undoubtedly he is the joker of the group and he is always ready with a quick reply. He always does everything with great and sincere smile on his face. He is a genius programmer, with stunning technical and theoretical knowledge. Andrea Giovanni Nuzzolese is a Researcher at the Semantic Technology Laboratory (STLab) of the National Research Council (CNR) in Rome, Italy. 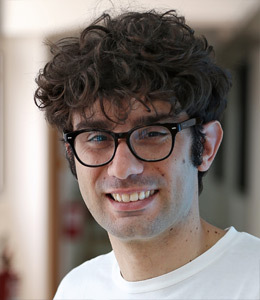 He received a PhD in Computer Science in 2014 from the University of Bologna (Italy). His research interests concern Knowledge Extraction, Ontology Design Patterns, Linked Data and Semantic Web. He has been a researcher in the EU funded project IKS (Interactive Knowledge Stack) and a main developer of Apache Stanbol software stack, which provides a set of reusable components for semantic content management. He has published scientific papers in international journals and conferences. The Second Open Knowledge Extraction Challenge, Nuzzolese AG, Gentile AL, Presutti V, Gangemi A, Meusel R, Paulheim H, In Semantic Web Challenges - Third SemWebEval Challenge at ESWC 2016, Heraklion, Crete, Greece, May 29 - June 2, 2016, Revised Selected Papers, 2016. An Ontology Design Pattern for Supporting Behaviour Arbitration in Cognitive Agents, Asprino L, Nuzzolese AG, Russo A, Gangemi A, Presutti V, Nolfi S, In Advances in Ontology Design and Patterns [revised and extended versions of the papers presented at the 7th edition of the Workshop on Ontology and Semantic Web Patterns, WOP@ISWC 2016, Kobe, Japan, 18th October 2016], 2016. ACM: Article Content Miner for Assessing the Quality of Scientific Output, Nuzzolese AG, Peroni S, Recupero DR, In Semantic Web Challenges - Third SemWebEval Challenge at ESWC 2016, Heraklion, Crete, Greece, May 29 - June 2, 2016, Revised Selected Papers, 2016. Sentilo: Frame-Based Sentiment Analysis, Recupero DR, Presutti V, Consoli S, Gangemi A, Nuzzolese AG, In Cognitive Computation, volume 7, 2015. Semantic reconciliation of knowledge extracted from text through a novel machine reader, Mongiovì M, Recupero DR, Gangemi A, Presutti V, Nuzzolese AG, Consoli S, In Proceedings of the 8th International Conference on Knowledge Capture, K-CAP 2015, Palisades, NY, USA, October 7-10, 2015, 2015. Extracting knowledge from text using SHELDON, a Semantic Holistic framEwork for LinkeD ONtology data, Recupero DR, Nuzzolese AG, Consoli S, Presutti V, Mongiovì M, Peroni S, In Proceedings of the 24th International Conference on World Wide Web Companion, WWW 2015, Florence, Italy, May 18-22, 2015 - Companion Volume, 2015. Conference Live: Accessible and Sociable Conference Semantic Data, Gentile AL, Acosta M, Costabello L, Nuzzolese AG, Presutti V, Recupero DR, In Proceedings of the 24th International Conference on World Wide Web Companion, WWW 2015, Florence, Italy, May 18-22, 2015 - Companion Volume, 2015. A Smart City Data Model based on Semantics Best Practice and Principles, Consoli S, Mongiovì M, Nuzzolese AG, Peroni S, Presutti V, Recupero DR, Spampinato D, In Proceedings of the 24th International Conference on World Wide Web Companion, WWW 2015, Florence, Italy, May 18-22, 2015 - Companion Volume, 2015. Managing Active and healthy aging with use of caRing servIce robots.